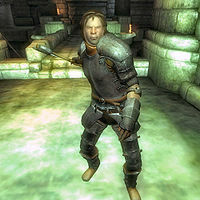 Gerard Melie is a Breton warrior currently guarding his leader, Roderick, who lies in a state of near-death in Fort Sutch, northeast of Anvil. Little do Gerard and his compatriots know, their efforts will prove futile. He wields a leveled war axe and is equipped with an almost complete set of leveled heavy armor, missing the helmet. He carries a small amount of gold. Gerard can be found around the very first corner in the fort when you enter through the eastern entrance, guarding two gates; the large one leading into the main room and a smaller one right next to the entrance. Should you pick the lock of the small gate, the suspicious Gerard will start to move and follow you through the tunnel and into the large room, basically extending his patrolling area to make life harder for potential intruders. He will be on his guard twenty-four hours a day, without ever eating or sleeping, and will, like the other mercenaries in Fort Sutch, attack you on sight. Should Gerard survive the quest, he will stay inside Fort Sutch indefinitely, as hostile as ever. This page was last modified on 2 July 2013, at 03:35.